The World Food Programme (WFP) has granted more than US$85 million (682 billion kip) to help the Lao government achieve the Sustainable Development Goal targets, as well as middle-income country status. The Lao state-run energy giant EDL-Gen spoke highly of the efforts made by the State Grid Corporation of China to promote power grid interconnection and interworking with neighboring countries under the Belt and Road Initiative. The Northern provinces of Huaphan, LuangPrabang, Oudomxay, Phongsaly and Xieng Khuang have been invaded by locusts, reaching plague proportions despite attempts to control the insects with chemical sprayings. Fifteen mining operations have had their concessions revoked after investors failed to implement their projects as agreed after they were granted concessions by the government. Minister of Foreign Affairs SaleumxayKommasith led a Lao delegation to attend the Special Asean-US Foreign Ministers’ Meeting which was held in Washington D.C., the United States, on May 4. Vientiane Capital, in cooperation with National Geographic Department and the Space Eye Lao Sole Company, will soon survey a location for the construction of a Continuously Operating Reference Station (CORS) in Sangthong District in Vientiane Capital. The Lao Government has allowed the Gold Dragon Investment Group of Cambodia to conduct a feasibility study for two development projects for digital library and electronic transaction systems in Laos. The South Korean Defense Ministry said on Sunday that it will send field-grade military attachés to Laos, Iran and Jordan to facilitate defense exports and strengthen military cooperation. Stakeholder groups met in Vientiane last week to learn about progress and responses on concerns raised at the 1st Regional Stakeholder Forum held in February in LuangPrabang to discuss the proposed dam in Oudomxay province. China has donated insecticide spray equipment to Lao authorities in support of the efforts to keep locust populations down in the northern provinces of Laos. National Assembly members proposed on 5 May that the government review article 38 of the new law on radio frequencies and clearly determine rental costs of wave frequencies for telecoms. 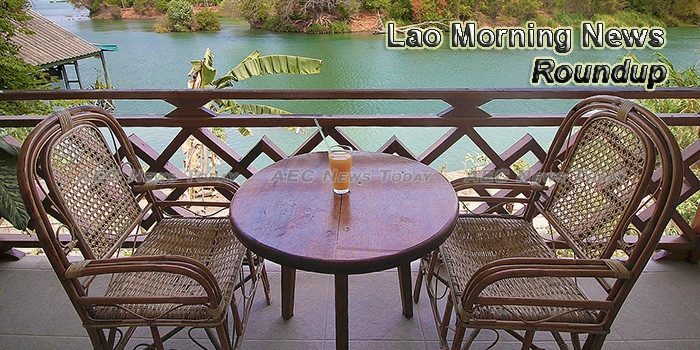 An earthquake measuring 4.9 on the Richter scale struck central Laos yesterday at 5:10am, according to a report by the Lao Post. Athisack Ratanavong, or more popularly known as ‘Sack Vong Cells’, is recognized in Laos as being a talented rock musician and singer for his work at Indee Records. Twenty workers at a power plant in northern Laos have quit their jobs after managers refused to raise their salaries, offering instead only to help them with the cost of their meals, sources said.